I spent the previous day with an old friend from high school who had moved to Maui some 22yrs ago with his wife where they've made a life for themselves. He showed me around his property along the Hana Hwy, some 3 acres where he spends a lot of time maintaining a large main house, two rentals, various other buildings and sheds, water and septic systems, all on three acres of land. "A labor of love", as he describes it, quite impressive but far more work than I would be willing to spend. I helped him with some minor painting while we were there and then had a late lunch in Paia on our way back to town. 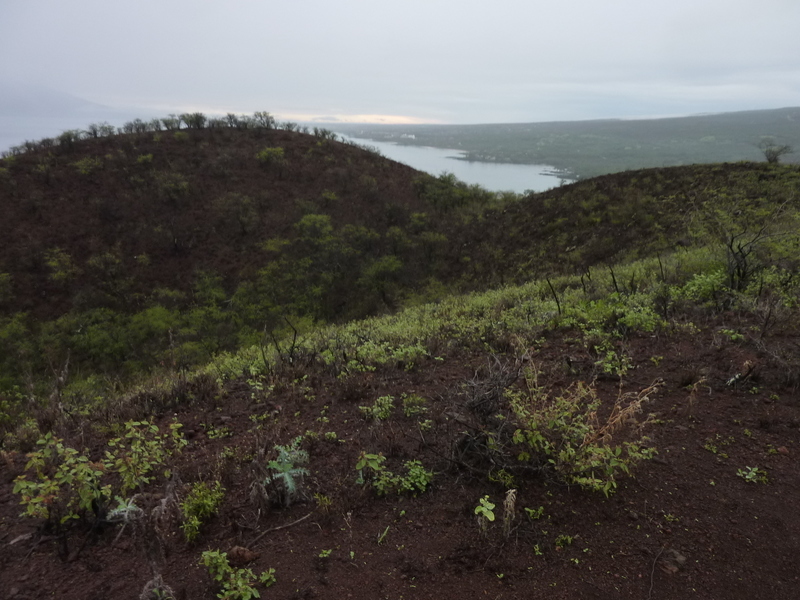 After I dropped him off at home, I drove up the Haeakala Hwy to spend the night at a higher elevation with plans to hike in the summit crater the next day. It's not a great place to spend the night because starting around 5a there is a steady procession of cars driving up to catch the magical sunrise. It's really hit or miss on the sunrise thing since it's very dependent on the right configuration of clouds to catch the colorful sky that gets so much hype. There would be no wonderful sunrise this morning because it was completely overcast and raining lightly. When I got the Visitor Center near the summit around 7a, the parking lot was full of cars from folks who had driven up for the sunrise and then planned to use one of the outfits that rents bikes for the downhill ride. The rain didn't let up and after about half an hour the cars started leaving one by one and the bike outfitters drove their trailers back down the mountain. The rain never did stop. In fact, as the morning wore wore on it started raining harder, then the wind started up viciously and it looked more like a Pacific Northwest storm than the Hawaiian tropics. I waited it out until after 1p, sitting in my van reading, texting the family and playing games. With no end in sight and the daylight hours running out, I called it quits. As I was leaving I saw a lone backpacker getting ready to head out on a trip I'm guessing he couldn't reschedule. He had a garbage bag for a rainjacket and another one over his pack. It was probably 40F out and it looked like the most miserable of experiences was about to unfold. I wished him luck under my breath as I drove away. A "labor of love". Sounds like my tree farm in Oregon. Decades of upfront costs and ongoing manual labor with thought of thinning the forest in 25 to 30 years.